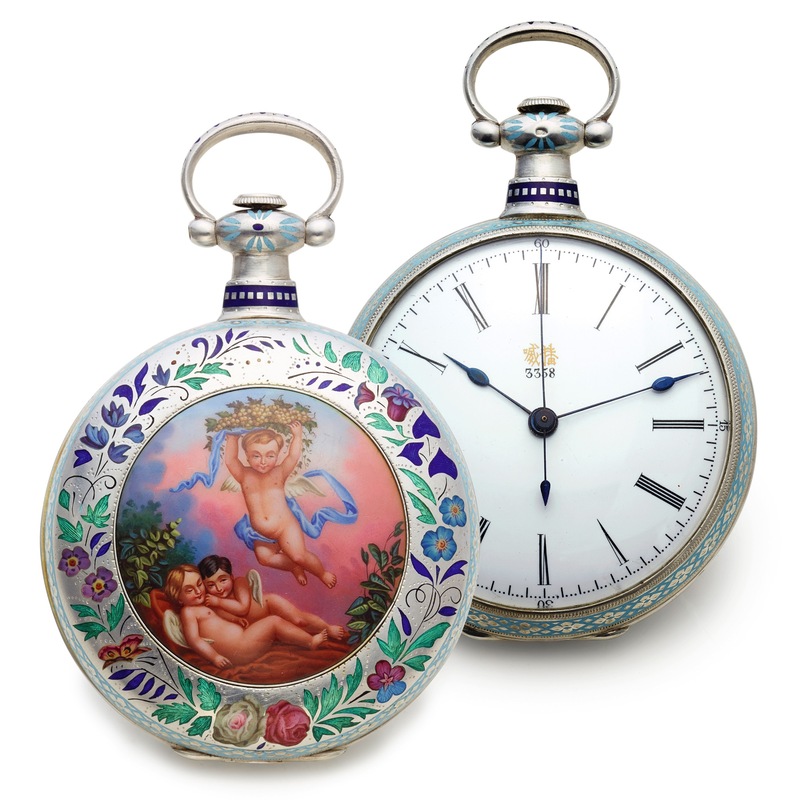 BOVET MADE FOR THE CHINESE MARKET GOLD AND ENAMEL Bovet, Fleurier, No. 3358. Made for the Chinese market, circa 1870. Very fine, silver and painted on enamel, center-seconds pocket watch. Four-body, "Empire", the back enamel panel finely painted with a scene of three cherubs relaxing in the country side, the bezels, pendant and bow with enamel, reeded band. Gilt-rimmed glazed cuvette. White enamel with narrow radial Roman numerals and outer minute and seconds divisions. Blued steel spade hands. Frosted gilt, Chinese caliber with free-standing barrel, cylinder escapement, three- arm gilt balance, blued steel flat balance-spring, index regulator. C. Four-body, "Empire", the back enamel panel finely painted with a scene of three cherubs relaxing in the country side, the bezels, pendant and bow with enamel, reeded band. Gilt-rimmed glazed cuvette. D. White enamel with narrow radial Roman numerals and outer minute and seconds divisions. Blued steel spade hands. M. Frosted gilt, Chinese caliber with free-standing barrel, cylinder escapement, three- arm gilt balance, blued steel flat balance-spring, index regulator. Dial and movement signed, case signed in Chinese characters. DIAM. 56 mm.